(a) Remove the bolt and disconnect the cooler refrigerant suction hose No.1 from the compressor and magnetic clutch. (b) Remove the O-ring from the cooler refrigerant suction hose No.1. (a) Remove the nut and disconnect the cooler refrigerant discharge hose No.1 from the compressor and magnetic clutch. (b) Remove the O-ring from the cooler refrigerant discharge hose No.1. (a) Disconnect the connector and clamp. (b) Remove the 2 bolts, nut and the cooler compressor bracket. (c) Remove the 3 bolts and the compressor and magnetic clutch. (a) Remove the 2 bolts and the bracket. (b) Place the compressor and magnetic clutch in a vise. NOTICE: Do not get the bracket and harness caught in the vise. (c) Using SST, hold the magnet clutch hub. (d) Remove the bolt, magnet clutch hub and magnet clutch washer. HINT: There is no set number of magnet clutch washers since they are used for adjusting. (e) Using a snap ring expander, remove the snap ring and magnet clutch rotor. NOTICE: Do not damage the seal cover of the bearing when removing the snap ring. (f) Remove the screw and disconnect the connector. (g) Using a snap ring expander, remove the snap ring and magnet clutch stator. (a) Fit the magnet clutch stator convex to the compressor groove as shown in the illustration and install the magnet clutch stator. (b) Using a snap ring expander, install a new snap ring with the chamfered side facing up. (c) Install the screw and connect the connector. (d) Using a snap ring expander, install the magnet clutch rotor and a new snap ring with the chamfered side facing up. Do not expand the snap ring by more than 30.5 mm when installing it. Do not damage the seal cover of the bearing when removing the snap ring. (e) Install the magnet clutch washer and magnet clutch hub. NOTICE: Do not change the combination of the magnet clutch washers used before disassembly. (f) Using SST, hold the magnet clutch hub and install the bolt. NOTICE: Make sure that there is no foreign matter or oil on the compressor shaft, bolt, and clutch hub. (a) Set the dial gage to the magnet clutch hub. (b) Connect the positive battery lead to terminal 3 of the magnet clutch connector and the negative lead to the earth wire. Turn on and off the magnet clutch and measure the clearance. If the measured value is not within the standard range, remove the magnet clutch hub and adjust it with magnet clutch washers. NOTICE: Adjustment should be performed with 3 or less magnet clutch washers. (c) Remove the compressor and magnetic clutch from the vise. (d) Install bracket with the 2 bolts. 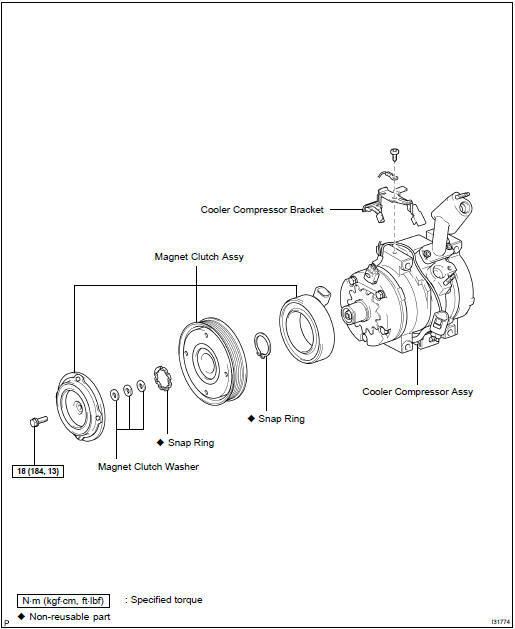 (a) When replacing the compressor and magnetic clutch with a new one, after gradually removing the refrigerant gas from the service valve, drain the following amount of oil from the new compressor and magnetic clutch before installation. When a new compressor and magnetic clutch is installed without removing the oil remaining in the pipes (of the vehicle), the oil amount will become excessive, which prevents heat exchange in the refrigerant and causes refrigerant failure. If the remaining oil in the removed compressor and magnetic clutch is too small in volume, check for oil leakage. Be sure to use ND-OIL8 or equivalent for compressor oil. (a) Temporarily tighten the compressor and magnetic clutch with the 3 bolts. (a) Fully tighten the compressor and magnetic clutch with the 3 bolts. NOTICE: Tighten the bolts in the numerical order shown in the illustration to install the compressor and magnetic clutch. (b) Install the cooler compressor bracket with the 2 bolts and nut. (c) Connect the connector and clamp on the cooler compressor bracket. (b) Sufficiently apply compressor oil to the new O-ring and fitting surface of the compressor and magnetic clutch. Compressor oil: ND-OIL8 or equivalent (c) Install the O-ring to the cooler refrigerant discharge hose No.1. (d) Install the cooler refrigerant discharge hose No.1 to the compressor and magnetic clutch with the nut. (c) Install the O-ring to the cooler refrigerant suction hose No.1. (d) Install the cooler refrigerant suction hose No.1 to the compressor and magnetic clutch with the bolt.